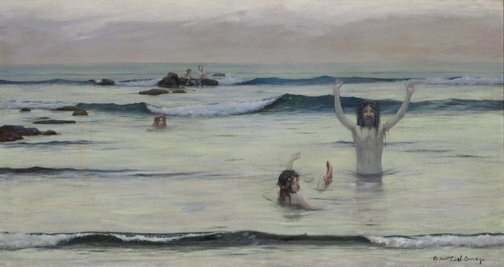 Jane Clark, Parallel visions: works from the Australian collection , 'Rupert Bunny / E. Phillips Fox', pg. 20-31, Sydney, 2002, 20 (colour illus. ), 21, 142, 147. The Art of Rupert Bunny , Parkes, 1991, 22-25, 22 (illus. ), 257. Deborah Edwards, Look , 'Rupert Bunny: An exotic in the history of Australian art', pg. 28-32, Sydney, Nov 2009, 29, 31. Deborah Edwards, Stampede of the Lower Gods: Classical Mythology in Australian Art , 'The Expatriates', pg. 3-8, Sydney, Sep 1989, 3, 4 (illus. ), 63. Anne Gérard, Look , 'Oz arts: our painters in the Paris Salons', pg. 37-39, Sydney, Dec 2006-Jan 2007, 37 (colour illus. ), 39. Art of Australia. Vol 1: Exploration to Federation , ‘The only school of art’, pg. 485-544, Sydney, 2008, 520, 521 (colour illus.). Daniel Thomas, Art and Australia , 'Australian collection', pg. 52-62, Sydney, Jul 1972, 52 (colour illus.). David Thomas, Art Gallery of New South Wales Quarterly , 'Rupert Bunny', pg. 550-575, Sydney, Oct 1970, 550, 551 (illus. ), 552, 554. David Thomas, Art and Australia [vol. 9, no. 4] , 'Rupert Bunny', pg. 328-337, Sydney, Mar 1972, 328. Singing in the heart: Music and the art of Rupert Bunny , 'From sea to shore in the early Belle Epoque', pg. 35-45, Queensland, 2007, 35, 35 (colour illus. ).